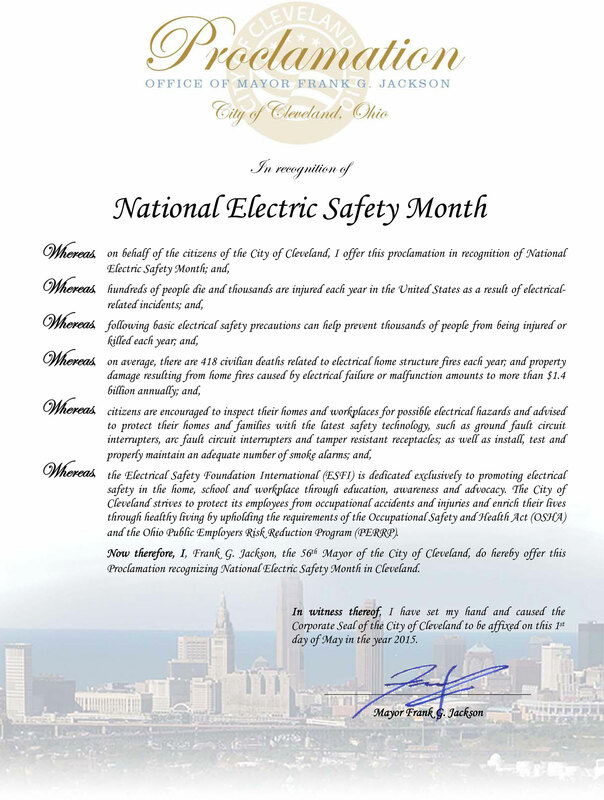 Cleveland Mayor Frank G. Jackson has designated the month of May, 2015 as Electric Safety Month. To raise awareness on the many electrical safety hazards that residents can prevent, Cleveland Public Power will utilize its social media platforms to promote tips that will aid in keeping residents and customers safe. CPP is following the leader of The Electrical Safety Foundation International (ESFI), which is dedicated exclusively to promoting electrical safety in the home, school and workplace through education, awareness and advocacy. The ESFI reports that annually there are 418 civilian deaths related to electrical home structure fires. The financial impact of these fires amounts to more than $1.4 billion annually, and more than six people are electrocuted weekly in the United States. We encourage you to check back throughout the month to learn how you can keep your family safe!